Yesterday, we shared more about the original classic novel Frankenstein by Mary Shelley — as part of our feature on This Dark Endeavor by Kenneth Oppel, which is a new prequel to the original book. 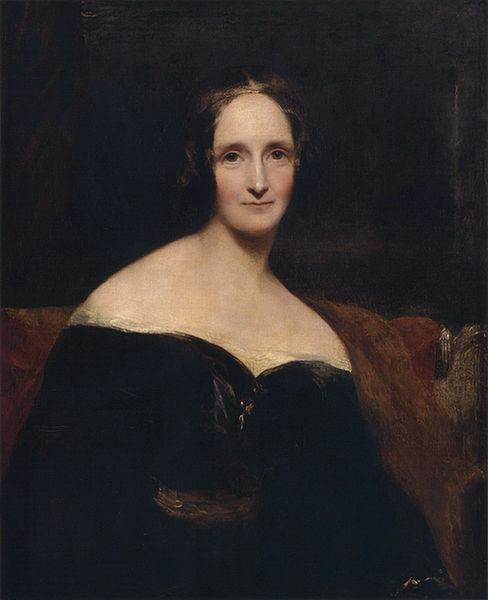 So today, we want to talk a bit more about the original creator of Victor Frankenstein: Mary Shelley herself! Born Mary Wollstonecraft Godwin in London in 1797 — Mary Shelley was raised primarily by her father, as her mother died when she was only 11 days old. It’s likely her father’s liberal and non-traditional rearing encouraged Mary’s creative inclinations. And in fact, it was through her father that she met her lover and future husband, Percy Bysshe Shelley. How I, then a young girl, came to think of, and to dilate upon, so very hideous an idea? I saw the pale student of unhallowed arts kneeling beside the thing he had put together. I saw the hideous phantasm of a man stretched out, and then, on the working of some powerful engine, show signs of life, and stir with an uneasy, half vital motion. Frightful must it be; for SUPREMELY frightful would be the effect of any human endeavour to mock the stupendous mechanism of the Creator of the world. Shelley also published a travel book, Rambles in Germany and Italy, and wrote for various other publications. Percy Shelley died in a sailing accident in 1822 — leaving Mary a widowed, single mother. After Percy’s death, Shelley returned to England, where she focused on raising her son and working on her writing. She died in 1851 from a brain tumor.